Comics Experience Blog: COMMUNITY NEWS: Paul Allor's Clockwork Anthology (& Scripts) on Graphicly! COMMUNITY NEWS: Paul Allor's Clockwork Anthology (& Scripts) on Graphicly! 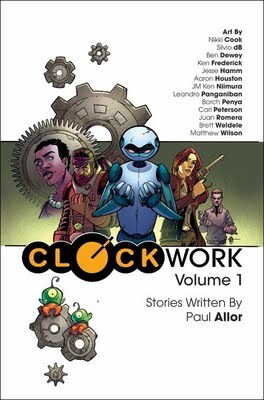 Comics Experience alum and Book Club Manager Paul Allor has released his comic book anthology Clockwork, Vol. 1 on Graphicly. And, for a limited time, you can read all twelve stories, totaling 60 pages of storytelling, for only 99 cents! Graphicly digital comics can be read on your desktop, mobile phone, tablet, and the web. Of special note for those interested in making comics, this digital version also contains the original scripts for all twelve stories as a Graphicly exclusive. Paul is known on the Creators Workshop for his clean, concise scripts, and this is a great opportunity for writers to view the completed artwork along with the original scripts! The book contains artwork by Comics Experience art alums and workshop members Ken Frederick and Carl Peterson, alongside well-known artists including JM Ken Niimura (I Kill Giants), Brett Weldele (Surrogates) and Nikki Cook (Memoir). Space-faring gorilla pirates, heart-broken robots, a beautiful gunfighter, and even a man on death row are among the cross-genre characters featured in Clockwork, Vol. 1. Check it out on Graphicly right here!